The Japan Baseball Hall of Fame and Museum announced election of 2 former NPB players and 2 former administrators for 2012 Hall of Famers. Manabu KITABEPPU, 54, former pitcher of Hiroshima Carp with lifetime record 213 W, 141 L, 5 SV and ERA 3.67, will be inducted into the Hall on the first day of All Star Games this summer along with the late Tsunemi TSUDA (1960 – 1993), another ex-Hiroshima Carp pitcher with 49 W, 41 L, 90 SV and ERA 3.31. 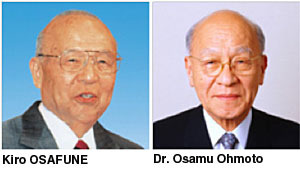 The Special Selection Committee for the non-players category voted Kiro OSAFUNE (1924 – 2007) and Dr. Osamu Ohmoto (1925 – 2008) but the date of their induction has yet to be decided. OSAFUNE, ex-catcher of Waseda University, served Secretary General of the Japan Student Baseball Association over half a century from 1952, was instrumental in setting up Baseball Federation of Japan, and was President of BFJ briefly before his demise in 2007. He contributed to create the All Japan Baseball Congress by assembling professional and amateur baseball leagues in Japan, which led to the participation by professional players to Sydney Olympics in 2000 and thereafter. Dr. OHMOTO, former Chancellor of Shibaura Institute of Technology, visiting professor of M.I.T. and visiting fellow of NASA, established the Japanese safety standard of metal bat for the Japanese High School Baseball Federation in 1970’s and served chairman of wood bat committee for Nippon Professional Baseball since 1985. In 2000, he started The AODAMO PRESERBATION SOCIETY which has planted approximately 22,000 AODAMO (Fraxinus lanuginose f. serrate.) seedlings in the forests of Hokkaido, on the northernmost island of Japan. The plan sees 2000 planted every year to grow to be ready of making baseball bats in 60 years’ time. This year’s election brings the number of elected Hall members to 177.